The question isn’t whether you’ll have a breach, it’s when. And when you do, your organization better have a plan in place to handle it. Organizations must clearly articulate what steps they’re taking to protect a person’s reputation and prevent negative financial consequences, says Pabrai. This often includes providing free credit monitoring services to affected individuals. 1. Discovery: How will the organization identify that a breach has occurred? Is the organization taking proactive steps to detect breaches? Have security controls been deployed to alert someone to missing laptops or devices? 3. Notification: Identify ahead of time which entities (eg, patients, the media, state or federal agencies) require notification in certain circumstances and the timeline for those notifications, says Pabrai. Also identify contact information for each of these entities so the information is easy to reference when a breach occurs. • Serve as a resource for patients: If a patient suspects he or she may be the victim of medical identity theft, listen to his or her concerns, provide resources, and investigate whether a breach may have occurred that led to the theft, says Rhodes. • Advocate for better access-level controls: Employees should have access only to the information they need to perform their job, says Rhodes. Be cognizant of individuals who are promoted or transferred to a new department because their access level may need to change, he adds. 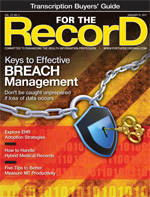 • Hire a data integrity specialist: Although many individuals in this role were originally hired during EHR rollouts to ensure that providers and others were accurately entering data and avoiding duplicate records, they are now increasingly focusing on unusual data activity in the record, says Rhodes. — Break the glass” data access. Audit this information regularly to determine who accessed the data and why. — Multiple unsuccessful attempts to access a device. Disable accounts that fit these criteria and require staff members to contact the IT help desk to reactivate the device, says Pabrai. — EHR-generated red flags, which some vendors can provide. • Create a robust training program: Make sure employees understand why they’re protecting patient data. “Patient data is like money. You don’t leave it out or unattended; you take care of it. You will track PHI pretty carefully when you think of it that way,” says Melamed.